Orthodontics is a special discipline of dentistry concerned with aligning the teeth and jaws to improve one's smile and oral health. A dentist usually recommends braces to improve the person's physical appearance. Through orthodontic treatment, problems like crooked or crowded teeth, bites, incorrect jaw position and disorders of the jaw joints are corrected. Orthodontic treatment can be done at nearly any age. An ideal time for placement of braces is between 10 and 14 years of age.Braces aren't just for kids. More and more adults are also wearing braces to correct minor problems and to improve their smiles. Your dentist will know what appliance is best for your particular problem, but the patient often has a choice. 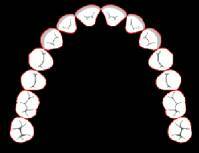 Braces most popular type are brackets, metal or plastic,ceramic that are bonded to teeth and are far less noticeable. Wires are used to move the teeth to the desired position. That depends upon your particular problem and treatment plan. The more complicated your spacing or bite problem is, and the older you are, the longer the period of treatment, usually. Most patients can count on wearing full braces between 18 and 30 months, followed by the wearing of a retainer for at least a few months to set and align tissues surrounding straightened teeth. The interconnecting wires are tightened at each visit, resulting in mild pressure on the brackets or bands to shift teeth or jaws gradually into a desired position. Your teeth and jaws may feel slightly sore after each visit, but the discomfort is brief. Yes. Any food that can bend wires or stick to the teeth. Cut down on sweets, chips and popcorns. Sugary and starchy foods generate acids and plaque that can cause tooth decay and promote gum diseases. Cut hard foods like carrots or apples into smaller pieces. Sticky, chewy sweets like caramel can cause wire damage and loosen brackets. No hard and crunchy snacks like Pizzas etc that can break braces, including popcorn, nuts and hard candy. With braces, oral hygiene is more important than ever. 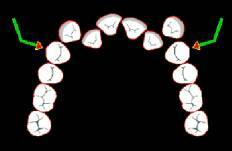 Braces have tiny spaces where food particles and plaque get trapped. Brush carefully after every meal with toothpaste and a soft-bristled toothbrush. Rinse thoroughly and check your teeth in the mirror to make sure they're clean. Insufficient cleaning while wearing braces can cause enamel staining around brackets or bands. Your family general dentist is responsible for coordinating your dental treatment, and this could encompass any orthodontic treatment plan, including diagnosis, examinations and some orthodontic procedures. Our visiting "orthodontist"-a specialist trained in the development, prevention and correction of irregularities of the teeth, bite and jaws and related facial abnormalities will take care of planning, putting and regulating braces as required. If your child has a problem that requires attention, your orthodontist may recommend interceptive treatment. Early intervention, which takes advantage of facial growth and tooth eruption, can lessen the severity of a problem, and it frequently makes the completion of treatment at a later age less time consuming and less expensive.